Instead of doing either of these things (neither of which would provide permanent relief anyway), the victim does what many volunteers in similar situations have done – she or he copes by depersonalizing relationships with the leaders and peer volunteers. She or he develops a detached air, becomes cynical of relationships with others, and feels callous toward others and the ministry. 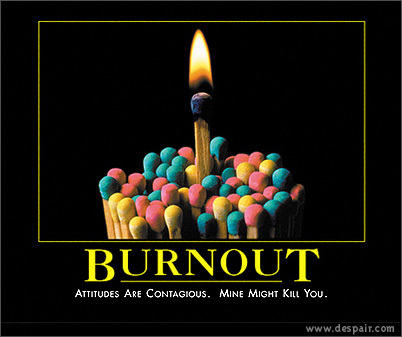 Volunteer leaders who become burnout victims are especially harmful to the ministry because such leaders create a ripple effect, spreading burnout to those they lead and influence. Unfortunately for the friends and family of an person who has reached this stage, the cynical and uncaring attitudes that develop toward peers, ministry leaders, or volunteers the lead may also be directed at non-ministry contacts, having a negative effect on all of the person’s social interactions. In addition to emotional exhaustion and depersonalization, a third and final aspect of burnout is a feeling of low personal accomplishment. Many individuals begin serving in ministry with expectations that they will be able to make a great impact on the lives of the youth in their community and their the church as a whole. After a year or two on the job, they begin to realize they are not living up to these expectations. Many systemic reasons may contribute to the gap that exists between a new volunteer’s goals and the veteran’s accomplishments, including (1) unrealistically high expectations because of a lack of exposure to quality volunteer training, (2) constraints placed on the volunteer by organizational policies and procedures, (3) inadequate resources to perform one’s job, (4) co-workers who are frequently uncooperative and occasionally rebellious, and (5) a lack of feedback about one’s successes. These and other characteristics almost guarantee that volunteers will be frustrated in their attempts to reach their goals of impacting this new generation, yet these people may not recognize the ministry and its leaders role in causing their frustration. Instead they may feel personally responsible and think of themselves as failures. When combined with emotional exhaustion, feelings of low personal accomplishment may reduce motivation to a point where performance is in fact impaired and that, in turn, leads to further failure. We must do a better job of caring for and encouraging our volunteers. We need to begin to provide soul care for our volunteers. We have got to stop treating them as if they are nothing more than a means to an end for our mission. There are also many great training opportunities/resources for volunteers to develop the skills and tools necessary to impact this generation but as leaders we must provide them. If we don’t then we are the ones responsible for their eventual burnout.